Hundreds of new students got their first taste of IU Southeast’s pomp and circumstance on Friday at the New Student Induction Ceremony. About 1,400 students and guests attended the ceremony, which is part of Orientation Day activities. In addition to the Induction Ceremony, students participated in social networking activities with Orientation Leaders and other students within their academic schools. Orientation Day also offered new students and their guests an opportunity to engage with student groups and student services during the Student Involvement Fair. 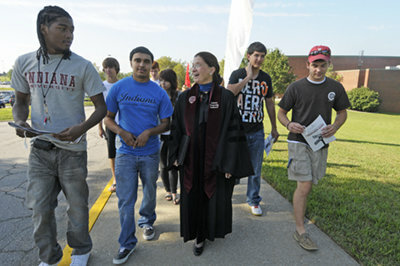 IU Southeast Chancellor Sandra R. Patterson-Randles - in full regalia - escorts new students to the Induction Ceremony.